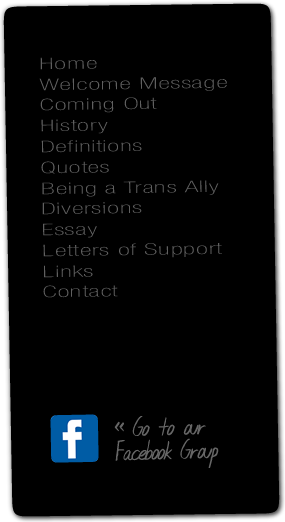 TransParent, a support network for the parents of trans children, was created in September 2005 as an associate group of the St. Catharines chapter of PFLAG. The local PFLAG chapter has been overwhelmingly supportive of the trans community and recognizes that trans people and their parents sometimes face different challenges than those in the gay and lesbian community. PFLAG parents have been great cheerleaders for the formation of this associate network. In October 2006, TransParent expanded its name and its parent base. On the recommendation of executive director of PFLAG Canada and with the enthusiastic and warm support of the St. Catharines chapter of PFLAG, the name was changed to TransParent Canada from TransParent. The alteration was due in part to a newsletter distributed by PFLAG U.S.A., which also bears the name TransParent. It was hoped that renaming the Niagara-based organization would clear up any possible confusion. Also leading in part to this decision was the wide response to a Globe and Mail column on Aug. 22 about the impact of the 2005 Toronto Pride Parade on the formation of TransParent. The Globe and Mail column, entitled “My daughter, my son, myself“ may be viewed on this website.